KARACHI (92 News) – Sindh Advisor on Information Maula Bakhsh Chandio has said that he is disappointed as demands of justice should have been fulfilled in the Dr Asim case. Talking to the media in response to the ATC verdict on Monday, he said that such decisions will increase provocation. 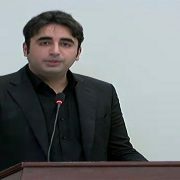 He said that the PPP was being targeted after nabbing a man. “No one seeks justice when he sees that justice is being done,” he said. The adviser said that no one was interfering in the court proceeding. “There is the course of law against the law,” he added. Meanwhile, the Rangers have decided to move court against the investigation officer of the Dr Asim case.